When the fire came it did not dawn on me that this was a major thing. In our families we drop everything and run to help when someone is ill and needs help or support. It is not necessarily the “I am sick can you come help clean my house,” sick but the “I am so sick I don’t know which end is up” sick. For that you go. You cook, you clean, you wipe fevered brows, do battle with the health care system, manage the flow of telephone calls and knocks on the door coming from well wishers and you worry and you are so exhausted sometimes you lean up against the wall and without realizing it slide down it until you are like a pretzel found at the bottom of the pretzel bag. No problem. We all do that for each other. We are spread from the Atlantic to the Pacific and from the United States to Canada but we look out after each other. When the fire came it never crossed my mind that someone would come to us. After all, we weren’t sick. My niece and my sister both offered. I said I wanted my sister and she came. She came fast. The fire was Thursday evening and she was here by Sunday morning. She offered to come sooner but I knew she needed to arrange for the care of her farm animals so I told her not to come on Saturday. On Sunday she got up on the middle of the night to catch a flight across the country that arrived from the east coast at noon. Even before we knew she was coming I had asked my niece, in a plaintiff wail I assume, to send me a dishtowel with a hole in it. I was fixated on that dish towel. Somewhere in my grief-clouded mind I must have been thinking that you could not have a dishtowel with holes if you had not had it long enough to get holes. 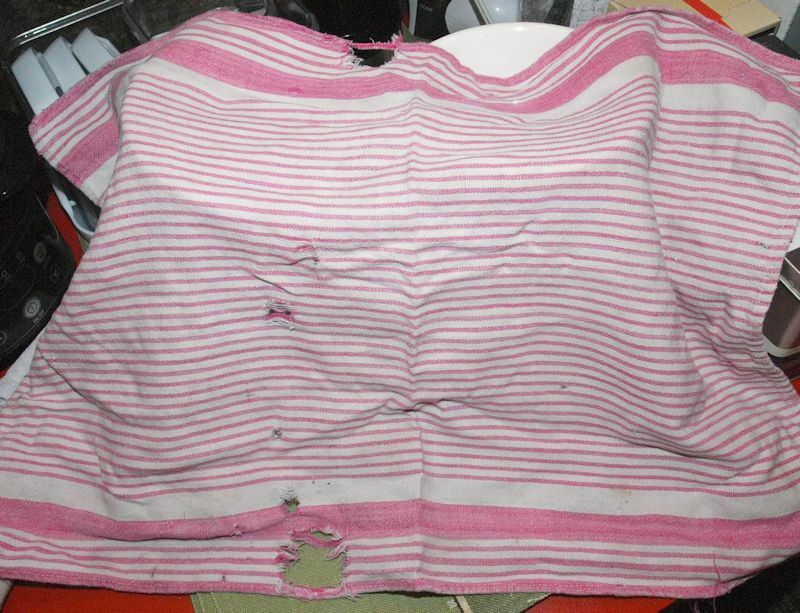 I wanted a dishtowel that showed wear. I wanted something with a history. My history had burned. When my sister got here and we were unpacking a box of history she brought us from her home, she nearly fainted when she saw the dishtowels my niece packed for us. I reassured her I was touched by then and it was exactly what I had asked for. Each time I use one of the 4 well broken in dishtowels I think of my niece, I think of her, I think of history, I think of home.